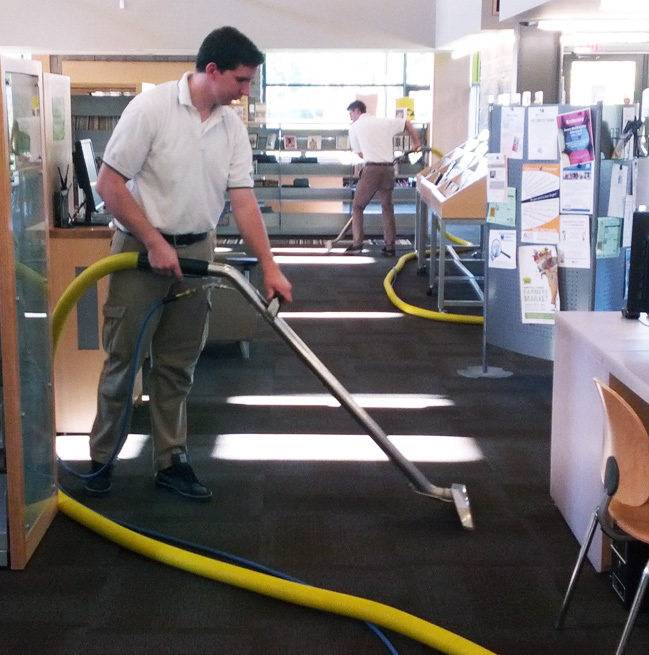 There are a variety of methods and equipment used to clean carpets. To narrow it down, we refer to either dry cleaning (low moisture cleaning) or steam cleaning (hot water extraction). It must be stressed that all methods do have their place. All have their strong points and weak points. Peacock Rug Care has been cleaning carpets in the Ottawa area since 1987. Having invested heavily in specialized equipment, education and have developed systems that are always on the cutting edge, our experienced technicians are courteous and gentle, and their main concern is to give the customer a great experience. Read more about our a 100% money back risk-free guarantee. Rug & Carpet cleaning services are offered in the Ottawa area only. The dry method could either be dry foam, bonnet cleaning, or dry absorbent powder. All use a pad or brush under a floor buffer (or a cylindrical brush). Dry foamers and dry absorbent powder cleaners scrub the carpet with a soapy solution or a cellulose detergent powder under a brush, allow it to dry, then vacuum the dirt out. Bonnet cleaners spray a cleaner on the carpet and then spin a thick cotton pad over it, rubbing the soil up into the pad. These methods are great for interim cleaning. They clean the visible soils on the top of the carpet yarns, but they fail in flushing the deeply embedded soils. But sometimes in commercial applications, a fast dry and a visual clean is all that is needed then. 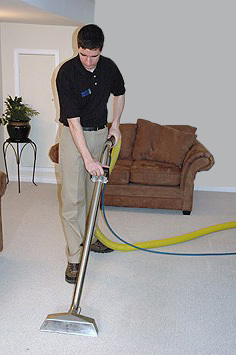 During steam cleaning or hot water extraction process, hot water is sprayed on your carpet and instantly sucked back out. This method actually rinses or extracts the soils out of your carpet. A recent technical bulletin from Shaw Industries, the world’s largest carpet manufacturer, recommends hot water extraction, which research indicates provides the best capability for cleaning. Ironically, the most popular, most highly recommended method has also produced some of the most fierce criticisms. If industry standards are not followed, substandard work will follow. For example, many cleaners run soapy detergents through their line when washing the carpets and then allow it to dry. Imagine doing your laundry, but skipping the rinse cycle. Your clothes will come out sticky and hard. It is no different with cleaning carpets. Skipping important steps to save time backfires on the customer. At Peacock Rug Care we feel the highest standard of carpet care should be exercised at all times. That’s why we employ a complete six step carpet cleaning process in Ottawa and area with a truck mounted hot water extractor. And our unique products leave your carpet completely residue free, very soft, and in most cases, quite dry. Anything less is substandard. We precondition all carpets with a self-rinsing soap-free emulsifier. We use 100% green products while leaving carpets completely residue free. Read more about the selection of green products we use to clean your carpets. Peacock Rug Care extracts using our choice of three styles of rotary extractors with one of our truck mounted cleaning machines (or a high pressure portable in inaccessible areas). Treating stubborn stains as we PowerDry carpets for quick drying time, our carpet cleaning process is second to none in Ottawa and area! There has been plenty of marketing information with regard to how unhealthy carpets are, with the purpose of “scaring” you into carpet cleaning. Read more about Indoor Air Quality and Carpets.